Our week moving to Jinja was a very good, but hectic one. 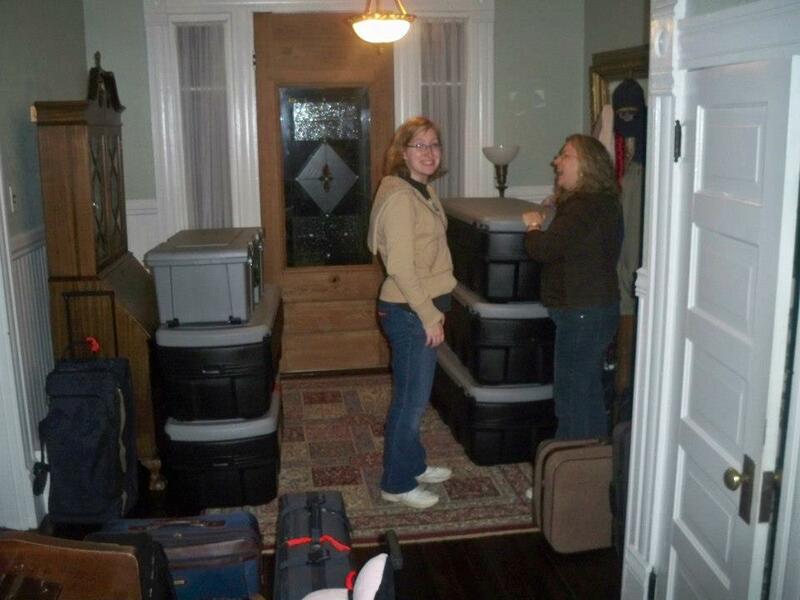 This blog today provides an overview of our week (8 days) of moving. Saturday, April 20th was probably one of the most difficult days. We are thrilled to have a renter in our house, and thrilled with the person God provided. But moving out of our house in one day comes with stresses and many emotions. By Saturday night we were staying at our friends (the Hoggards), who live in Marion. Rudy has been a mentor of mine for years. Love both these folks. We had a lot of “stuff” to move. Just over 1/2 of it did not make it. Supposed to be here Tuesday. Saturday and Sunday we spent with Family and friends. 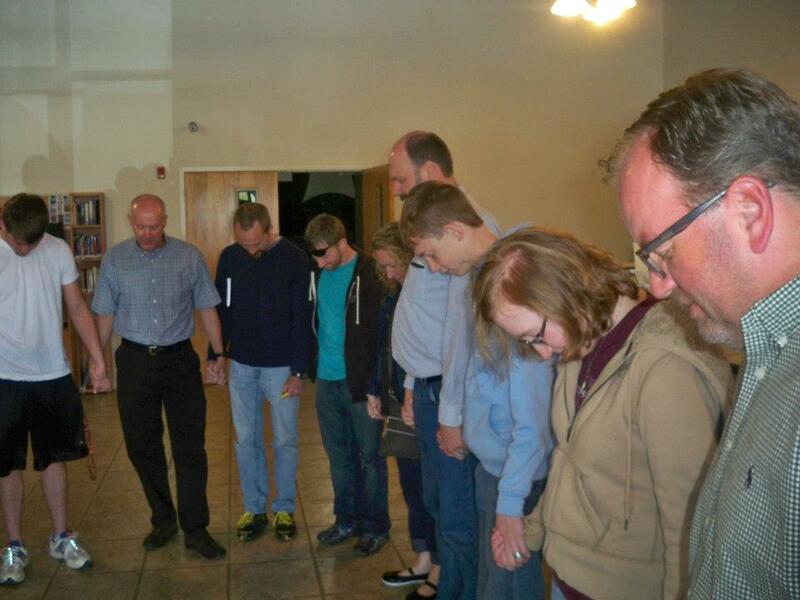 Our church, Grace Community Church (www.graceforall.org), prayed for us on Sunday. Again, it was an emotional day. I learned earlier in the week about the word, “contentment” – “An internal satisfaction which does not demand changes in external circumstances.” While emotional, our hearts seemed content. Jinja is clearly where God is calling us. Sunday night we were back to the Hoggards to sleep. I still had not fully packed, believe it or not. Molly and Rudy were excellent hosts (and are excellent friends). They put us up and used their spiritual gifts of giving and hospitality to encourage us. I am sobered and happy that God has placed both of them in our lives. We said good-bye to them. We said “good-bye” to our dog, Sox, too. Over the last two weeks she could tell something was going on. She seemed sad. Alexis snapped this picture of her. 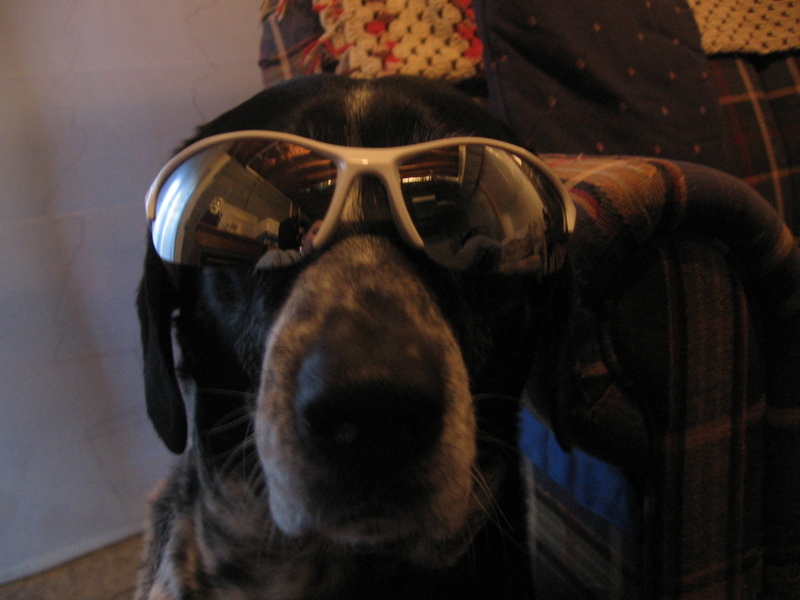 We said “Good-bye” to our dog, Sox. She wanted to hide her tears, but she is with Keli & Steven (our renters), who take good care of her. Monday (22nd), a quick visit to the bank for some final preparations. My mom, two weeks earlier, had gotten sick with liver problems. Without going into details it was rather clear and Mom said that she thought this was clearly a spiritual attack on her. She is doing some work for us while we are gone, and we will be depending on her tremendously. She had a biopsy of her liver at noon the day we left. Wish we could have been there. The results would come in later in the week, just liver damage. Nothing conclusive causing it and she was feeling better. Praise the Lord, who is our Defender and Healer! 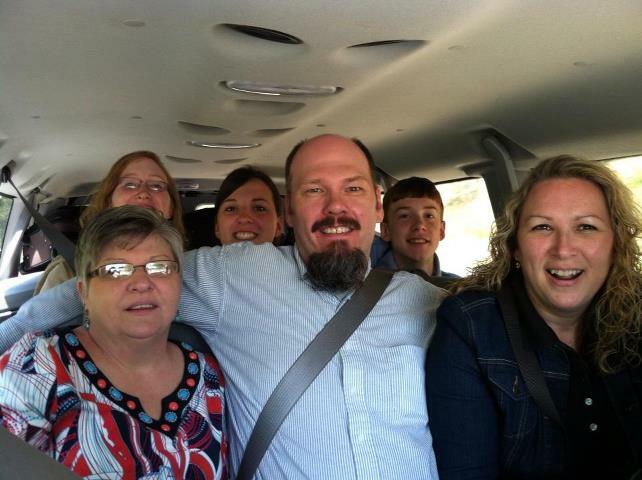 At noon on Monday, the entire Grace Community Church staff took us to the airport in Charlotte. Jerry, we love you. And we love each of the Grace Staff. Stan, the Missions Committee Chair, prayed for our trip. He had just returned from Ecuador a couple weeks earlier. Monday (22nd) PM – Our flight left Charlotte at 5:05 PM, with all our luggage. Thanks for the help from the Grace Staff!! We flew to Toronto on Air Canada and left Toronto at about 10:00 pm flying all night to Zurich. We arrived in Zurich about 4:30 am Eastern Daylight Time (10:30 am Swiss Time) on Tuesday. Tuesday (23rd) – Although we were tired, we stayed up all day Tuesday and did not check in to our hotel (Holiday Inn Messe) until 2:00 pm. 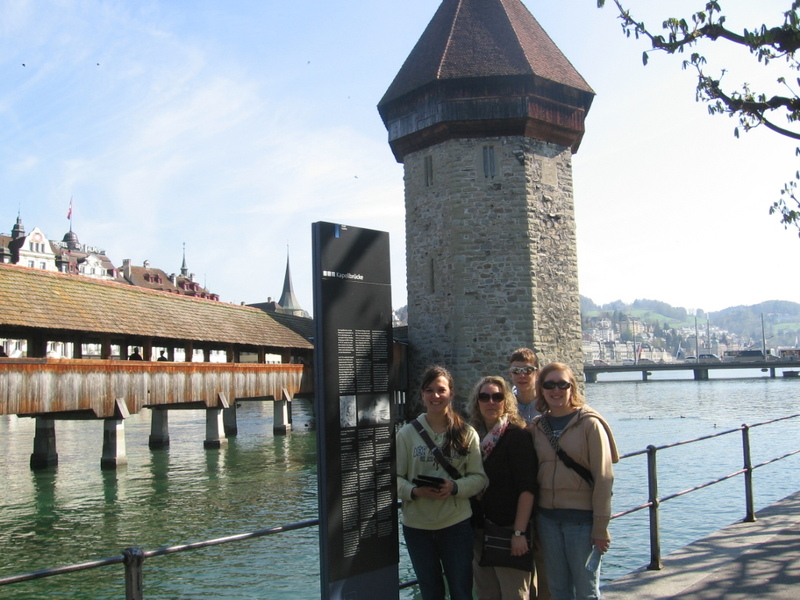 After checking in, we used Tuesday afternoon to familiarize ourselves with Zurich, the trams and the train station. 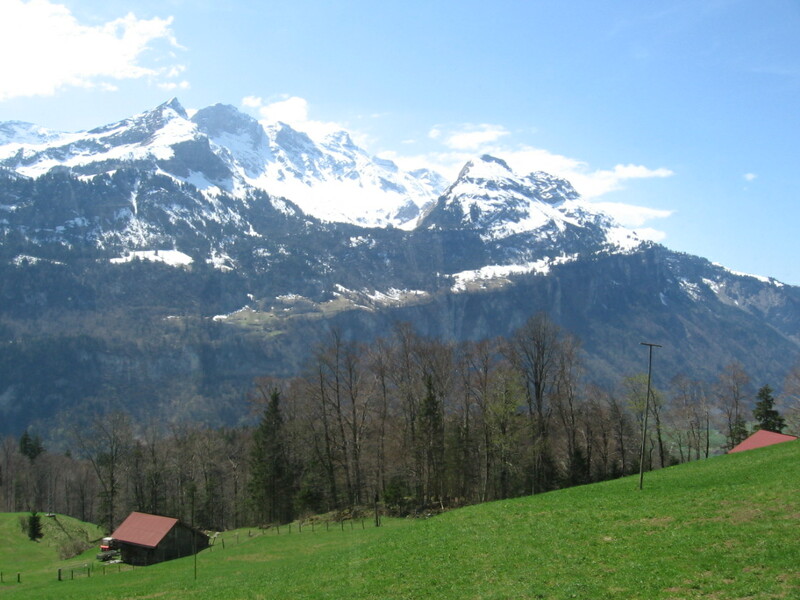 We also looked into a tour of Switzerland, which we ultimately took on Wednesday. We tried to meet up with Andy and Karen Lee (Ambassador College friends) for lunch in Zurich, but our schedules just did not work out. We went to bed (very tired) about 9 PM local time. Wednesday (24th) – The weather was perfect! Karen told me Tuesday night it had snowed in Zurich on the previous Saturday. Tuesday was cloudy, but today (Wed) was spectacular! Upper 60’s with clear skies and low humidity. We were up rather early for a super breakfast buffet at the Holiday Inn – a nice European / American mix. 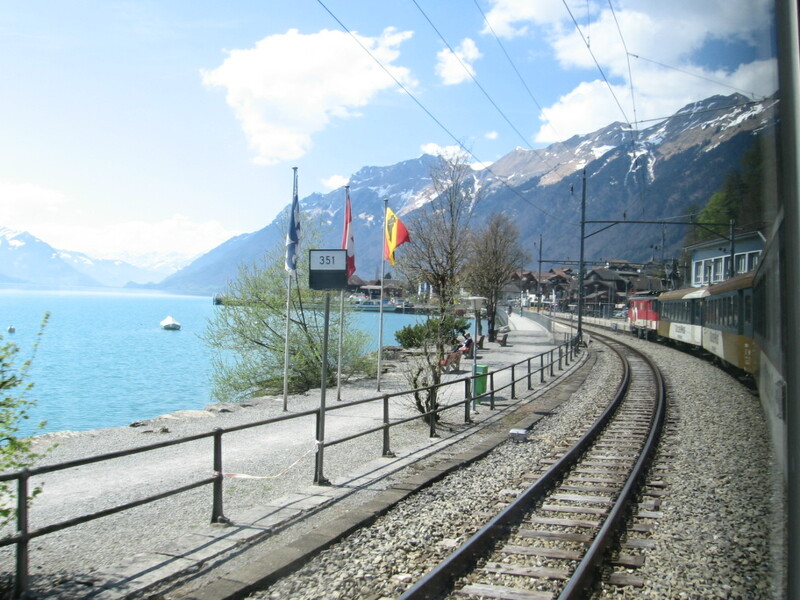 We left for the train ride around Switzerland at about 8:30 am. 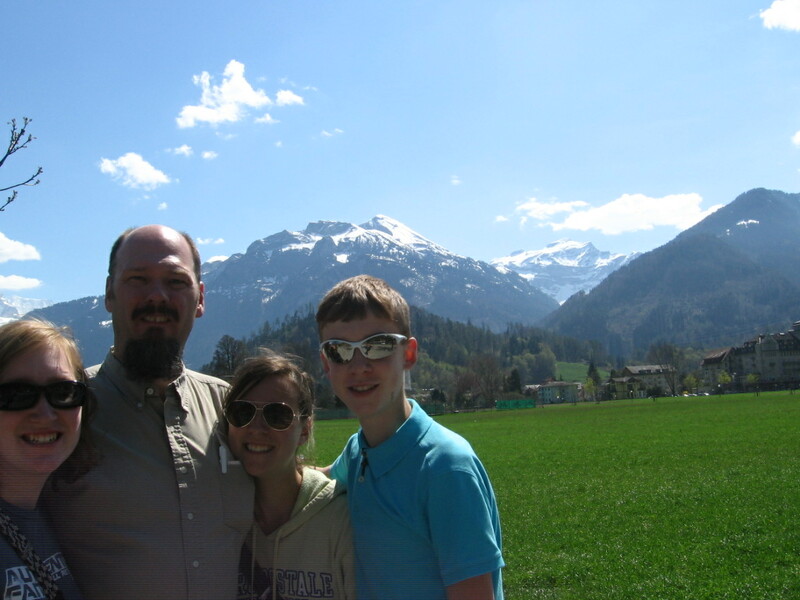 Zurich to Lucerne (thanks for the recommendation from Dave and Jamie Walters) to Interlaken to Bern and then back to Zurich. Very scenic route!!! Coming into one of the towns on the route. 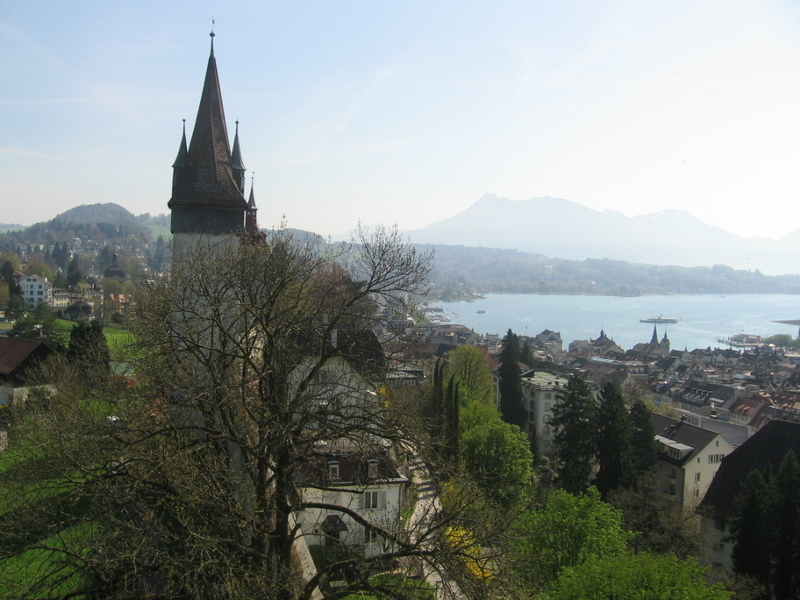 Another shot of Lucerne from above the protective wall built in the 1300’s. At Interlaken, Switzerland. Beautiful town. Reminds us of Banff, Alberta…just more green. Wednesday PM – We arrived early to the airport in Zurich. We are glad we did! Our luggage was a problem with SwissAir. SwissAir only allows 1 piece of luggage per passenger. Carry-ons were no problem. We had to pay for the rest of our bags and send them on cargo airline. SwissAir wanted an outrageous amount, and being missionaries made no difference. It wasn’t cheap with the cargo plane either, but much cheaper than SwissAir. Michelle and I were so concerned and not sure what to do. God is teaching me (Mark) about the necessity of having joy in difficult situations. That was a test I failed in this situation. I did remain calm, but was not happy. The good news is, our luggage is to arrive in Entebbe this coming Tuesday (April 30th). Thursday (25th) – We flew on SwissAir all night Wednesday night (leaving at 10:45 PM) and landing in Johannesburg, South Africa at about 9:45 am Thursday morning local time. I barely slept at all, but the meals were great. Time zone is the same as Zurich (6 hours ahead of EDT and 9 hours ahead of PDT). Our flight left South Africa for Entebbe at about 2:00 pm local time on Thursday and arrived Entebbe at 7:00 pm Thursday night. The airport in Entebbe has been upgraded and is nicer than we (Michelle and I) remembered. The visas were no problem. Joshua immediately felt the “heaviness” of the air in Entebbe. It can be humid. The smells of Uganda that night, as we drove to our hotel in Entebbe, reminded me of our earlier short-term trip a few years ago. The sun sets at 7:00 pm each night (since Uganda is on the equator), so it was dark by the time we were in the small SUV’s which transported us to the hotel. 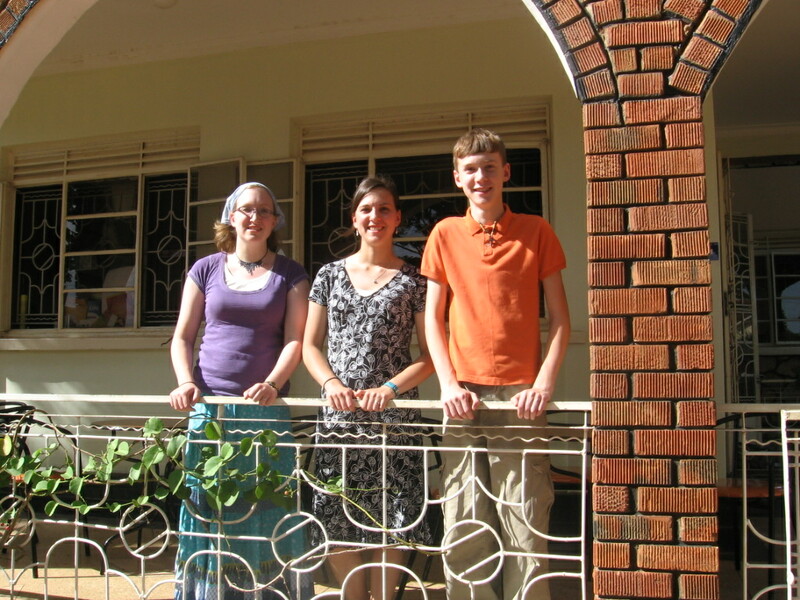 The Boones did a great job reserving this hotel for us – clean, professional staff for Uganda standards. Friday (26th) – We woke up early (about 3 am) to a thunderstorm. Alexis was the only one to sleep through it. We had a small breakfast at the hotel and departed for Jinja at 10:00 am local time. The ride through Kampala (the capital of Uganda) was plagued by traffic. The heat was tolerable, but we drove with our windows down. Air conditioning is a luxury in Uganda. On Saturday night, as our family reviewed our Friday trip, I asked during our family quiet time, “What surprised you the most about Uganda?” Joshua answered, “the traffic.” He said it seemed at times that a 2-lane road became a 4-lane road – with motorbikes, bicycles and pedestrians mixed in the confusing jumble. He was right. Ugandans drive on the left side of the road, too. The drive was anxiety producing at times, although the driver was very experienced. On Friday, we arrived in Jinja at about 1:30 PM local time. 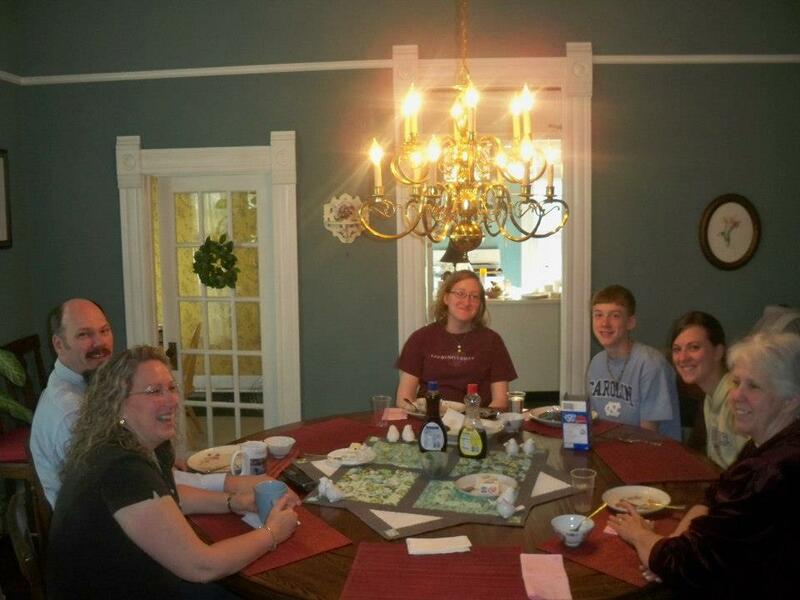 Our Equip team met us at the Guesthouse where we will be staying until Tuesday (30th) – Jeremy and Tamara Boone, Luke Anderson, Anna and Patrick Draku, and Chris and Jane Sperling. Anna and Patrick, we had not met. We will be staying in the Sperling’s house beginning some time in June for one year while they are on furlough in Abbottsford, BC, Canada. Friday evening (26th) – the Boones invited us over for Dinner. Tamara made homemade pizza. That was even better than the rolexes. Then we turned in for the night around 11:00 pm. Saturday (27th) – was a day for settling in. We slept late. Had breakfast at the Guesthouse (we have no kitchen and they provide one affordable meal per day). And then Jeremy took us to town to help with getting Internet and cell phone, so we could communicate here and back home. Sunday (28th) – Church service with Acacia Community Church. Our Equip team members all attend this church, as well as the Via family from Raleigh, NC (thanks for the heads up Chelsea Poteat). The afternoon was spent chatting with family on FaceBook and preparing this blog. All in all, this week has been a whirlwind of a trip, but we’re happy we’re here. Joshua said earlier this week, “This feels like home, just different.” The message Sunday morning was excellent, and needed. The church is going through the 2 epistle of Peter. Today they were in chapter 1. Pastor Terry covered 2 of the 7 steps to spiritual maturity, self control and perseverance. Sobering message, and very timely for us. I’ve often wondered about how the children will cope with this experience, although each of them have received their own individual call to Uganda. 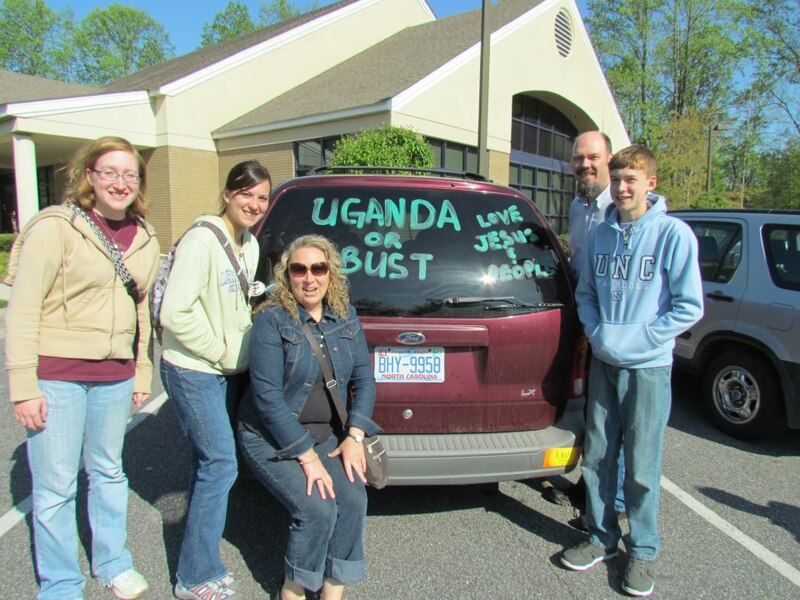 As we were sharing last night in our family quiet time, Brittany shared that she thought God had impressed upon her as we were driving to Jinja Friday that Uganda is her home now, and God is at work. She believes God wants her to keep her eyes open to where God is working so she can join Him. The kids at the front entrance to the Guesthouse, Sunday afternoon. Michelle and I have watched our kids, as well as ourselves through this process. It has been absolutely amazing to see how Jesus has prepared us for such a time (and place) as this. This is not to say we are any better or any more special than anyone else, but God is special. Each of us struggle day to day. We have our weaknesses. We fail miserably, but God is faithful! The situations (both good and bad) He is using in our lives (yours and mine, as we trust Him), are for His glory and ultimately for our good. The situations are not good, but the results of those situations God will work for good. That, He has promised us! Thanks so much for your support and prayers! Jesus first!!! Here we are in our room in the Bridgeway Guest House. The children are in a room beside us. We are here until Tuesday morning. This is where we stayed when we were here before.